Wed. #2 is HERE. Please follow us on Tumblr or Twitter, subscribe to us on YouTube or like us on Facebook. Don't miss Thursday Night AMP taping at 9 ET! With the cheap plugs out of the way here's Thursday's latest wrestling news. The YouTube subpocalypse is for real and my YouTube channel could use your support. I need 1,000 subscribers to survive and it's at 726 subscribers right now, an increase from when the bad news broke, but I still need 274 more. While the revenue generated is small compared to a Game Grumps or a NoDQ it's still very much necessary to keep our operation running. Please subscribe to Mistah MegaManFan and help me out! 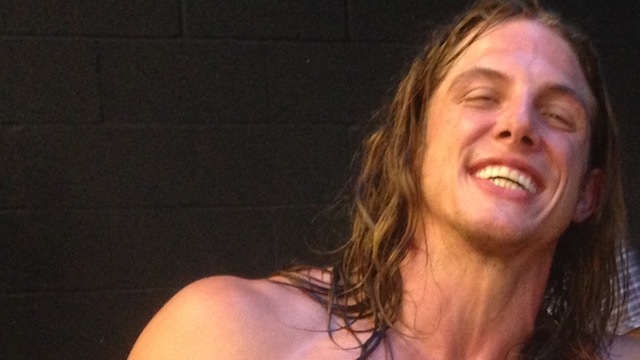 Once again Matt Riddle is addressing rumors that he's headed to WWE: "It's not that I don't love the indies, it's just time to move on. Places like EVOLVE, Beyond, those were the companies that gave me an opportunity, gave me a platform, and gave me the chance to run with the ball and showcase my skills. I got to mix it up with a world array of talent. I need more substance, I need to grow. I'm a shark and I swam in a lot of different ponds, but I'm ready for the ocean. It just depends if I'm going to the Atlantic or the Pacific." A new clip of The Miz' reality show can be found below. In this interview Alicia Fox talks about breaking her tailbone: "It was a really humbling moment. Three months recovery time. I was here for that whole time. The first half was rehab and sitting on a donut. It was interesting though, it was the first time where I could take a moment to step outside of my character. Not that I like, embody Alicia Fox, but when you're on the road nonstop, performing all the time, you don't really get to take inventory of your life. As I was looking back at my journey, it was like the volume turned down a bit. Learning how to be Victoria Crawford was a little uncomfortable. I had to learn a routine. A bedtime. Getting up and going for a run. I missed out on developing routines when I was on the road." Here retired announcer Ken Resnick says he's happy Hulk Hogan got reinstated to the WWE Hall of Fame: "I worked with Hulk in the AWA, I worked with Hulk in WWE, but we also spent time together. We spent a lot of off-camera time together talking. I saw the way he was in dressing rooms with other people and those comments and those comments he made were absolutely disappointing. But I can tell you in all the years I had known Hulk I never, ever saw anything close to that. Never saw that side of him. He certainly worked with and did programs with African-American wrestlers... he always liked them, respected them. I'd like to think that everybody has a breaking point and when those comments came out, he was going through the bitter, very public divorce with Linda, his son was going through everything as a result of that horrible car accident. I kinda think he just snapped. He was not the Hulk that I knew and we've gotten together on a couple instances since. He's always been great to me, very warm to me. I can understand, certainly, on the heels of those comments, WWE kind of taking him off to air for a while, but I'm very glad that he's back in the Hall of Fame and I've seen a number of comments he has made since that I choose to believe and feel were absolutely genuine. I know how much fans meant to Hulk and mean to Hulk because I had countless opportunities to see him interact. I think he's genuinely not only hurt for himself for having said those things and having them become public in the way and the manner of which it did, but I think he took it very hard and personal that he disappointed a lot of his fans. I'm glad that he's back and have nothing but the most love and respect for him."